Stage 2 mesothelioma means cancer cells may not have spread far, but they are entering nearby lymph nodes. Prognosis at stage 2 may still be favorable, and there are plenty of treatments available to extend life expectancy. The 2-year survival rate for some patients at this stage is around 38 percent. Dr. Jacques Fontaine describes mesothelioma surgery and who are the best candidates for this type of treatment. In stage 2, tumors have developed in the pleura (the protective tissue lining around the lungs). The cancer may have started to grow into the breathing muscle under the lungs (the diaphragm) or into the lung tissue itself. There is one main difference between stage 1 and stage 2 pleural mesothelioma. By the second stage, cancer cells have begun to spread into lymph nodes near the main tumor site. Your lymph nodes are a series of filters that keep germs out of your bloodstream. Once cancer cells reach the lymphatic system, they can spread into the bloodstream and throughout the body. Once mesothelioma cells have spread to lymph nodes, the case is considered stage 2 or higher, even if the main tumor growths are still very small. Peritoneal mesothelioma has no formal staging system. Doctors often define it as stage 2 if there is local tumor growth and some lymph node involvement. Stage 2 patients can benefit from an approach called multimodal therapy. They must be healthy enough to endure an aggressive treatment plan. Multimodal therapy combines tumor-removing surgery with chemotherapy and radiation therapy. This combination is currently the gold standard for mesothelioma treatment. It has helped some patients live years beyond the average prognosis. Early-stage patients often have a number of promising experimental therapies available to them as well. In most cases, stage 2 mesothelioma does not cause symptoms. If symptoms do arise, they are easily mistaken for signs of the flu or pneumonia. The discomfort stems from tumor growth or a buildup of fluid in the pleura (known as pleural effusion) constricting the lung. Some stage 2 cases are discovered through cancer screening. More often they are caught by accident when a doctor checks a patient’s chest for an unrelated reason. Mesothelioma has a long latency period. Decades pass before the cancer even begins to develop. Once it begins to develop, it grows quickly without causing symptoms until stage 3 or 4. Most mesothelioma cases are diagnosed after the cancer has already advanced beyond stage 2. Connect with a specialist who can confirm your stage and create a treatment plan for you or a loved on. Doctors have developed three staging systems for pleural mesothelioma. The TNM system is the most commonly used today. The three systems use different definitions for stage 2. TNM Staging System: Mesothelioma is in the pleura on one side of the chest, and it may have begun to spread into tissue in the lung or diaphragm. Cancer has also spread to nearby lymph nodes, but it has not spread to distant sites. Brigham Staging System: Tumors are confined to the pleural lining of the lungs, and nearby lymph nodes are cancerous. Butchart Staging System: Cancer has grown from the pleura into the chest wall. It may also have spread into the diaphragm, the organs between the lungs, or the lymph nodes of the chest. 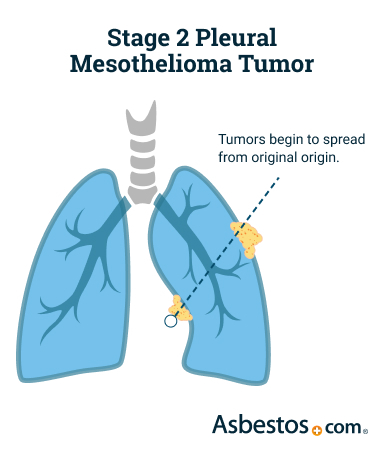 Stage 2 mesothelioma is treated with surgery, chemotherapy and radiation therapy. Even with minor lymph node involvement, there are effective treatment options available to early-stage mesothelioma patients. Clinical trials offer experimental treatments such as immunotherapy. There are two main surgical options for removing pleural mesothelioma tumors. The difference comes down to whether or not surgeons have to remove one of the patient’s lungs to eliminate all the cancer. Each patient’s medical team must create a treatment plan based on the patient’s overall health and how far the cancer has spread. The chemotherapy drugs Alimta and cisplatin are the most common treatment for mesothelioma. Doctors may use drugs to shrink tumors before surgery or kill remaining cancer cells after surgery. Patients not eligible for surgery may benefit from chemotherapy as a solo treatment. Radiation can also be used to shrink tumors before surgery or prevent local recurrence after surgery. Patients can access new therapies the U.S. Food and Drug Administration has not yet approved through clinical trials. These trials test immunotherapy, gene therapy and novel combinations of chemotherapy drugs. Patients often have to be relatively healthy to volunteer for these research studies. Many people diagnosed with stage 2 mesothelioma qualify for clinical trials. Is Stage 2 Mesothelioma Curable? Unfortunately, no stage of mesothelioma is curable. But therapies can control the cancer to help people live with mesothelioma. Pleural mesothelioma is an aggressive disease. Most patients do not survive longer than two years after diagnosis. Stage 2 mesothelioma carries a better prognosis than more advanced stages of the cancer. Doctors and researchers are testing new drugs in hopes of finding a way to control and ultimately defeat mesothelioma. Many mesothelioma specialists are also trying to perfect their treatment strategies. The goal is to help patients manage the cancer as a chronic disease rather than a terminal illness. Their efforts have resulted in some fortunate mesothelioma survivors outliving the average life expectancy for mesothelioma by years. About 38 percent of stage 2 mesothelioma patients live longer than two years. Researchers calculate what percentage of stage 2 patients survived at least two years and at least five years. This is based on the statistics from thousands of patients diagnosed in recent years. These survival rates reveal the seriousness of this diagnosis. But because every patient is different and treatment technology has changed since these statistics were collected, these survival rates cannot predict the outcome for an individual patient. An individual patient’s life expectancy depends on many factors. Their overall health and the specific cell type of their cancer play important roles. American Cancer Society. (2017, December 20). Survival Statistics for Mesothelioma. National Comprehensive Cancer Network. (2014). NCCN Guidelines for Patients: Malignant Pleural Mesothelioma. Tannapfel, A. (2011). Malignant Mesothelioma: Recent Results in Cancer Research. Springer: Berlin. Yan, T., Cao, C. & Munkholm-Larsen, S. (2010, February 15). A Pharmacological Review on Intraperitoneal Chemotherapy for Peritoneal Malignancy. World Journal of Gastrointestinal Oncology. Schil, P.V. et al. (2008). Staging of malignant pleural mesothelioma. In Baldi, A. (Ed. ), Mesothelioma from Bench Side to Clinic (357-366). New York: Nova Science Publishers, Inc.